1. Melt 15g of the butter in a large saucepan and gently fry the onion for 3 minutes. Add the monkfish and fry for a further 3 minutes. Lift the fish out onto a plate, add the garlic and rice to the pan and cook, stirring for a further 2 minutes. 2. Pour the wine into the pan and cook until bubbling and reduced. Add a ladleful of the stock and cook stirring for a couple of minutes until the stock is absorbed. Continue to cook, stirring frequently for about 20 minutes, gradually adding the stock a ladleful at a time until the risotto is thick and creamy – you may not need all the stock. The rice should be soft but retain a little bite. 3. Stir in the peas, return the fish to the pan and heat through for 2-3 minutes. While heating, beat the dill and capers into the remaining butter. 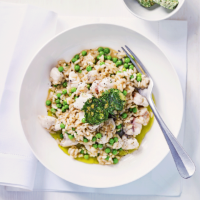 Season the risotto and ladle into warmed serving dishes. Spoon the flavoured butter on top for melting into the risotto.